As part of my professional growth, the goal I set for myself was to learn how to create and implement an effective action plan so that I can teach this life-skill to students to be more productive in academics as well as in life. During the last three years, I have observed that when students are given a task, most of them do it. However, apart from a few exceptions, while most of the work submitted reflects potential, it also mirrors poor quality because of a lack of effort in planning and processing the work given, as most of them have the chronic habit of procrastination. Another amusing yet annoying reason that influenced me to choose this goal was the fact that when last year I sought the feedback of students on the project work I gave them, most of them agreed that they could not submit their work on time because they procrastinated due to the long time frame I gave them! Even though I often spoke to them about managing their time, things did not improve. So, it occurred to me that maybe they did not know how to make an effective action plan. Their usual yet valid complaint was that they had lots of project work to do. That is the reason why they needed to learn how to create and implement an effective action plan, which I needed to learn first before teaching them. Most assignments I give my students are project-based. I assess not only the quality of the product but also the process. So, this year one of the specific areas of assessment of the process in the rubrics was action plan. Students were assigned three long-term project works and three mini project works where I stressed the need for creating and implementing effective action plans. As I mentioned earlier, I was on a ‘trial and error’ mode, so were my students. After checking their project files, I observed that their action plans were not clear about work distribution and setting a timeline. Since I did not give them any template for an action plan, it was time consuming for me to assess their action plans. Therefore, I made a template based on a YouTube video lesson with detailed reference to the last project work I gave them. I thought of referring to other resources on the subject, but I learned that once you have the basic idea of an area, you can adapt it to your own context because every teaching-learning environment is different. So, I will continue to experiment and refine the tool. In the four long-term project works, students of classes IX and X were required to make effective action plans, which carried 32% of numerical weight-age in the marking scheme designed for the three projects. 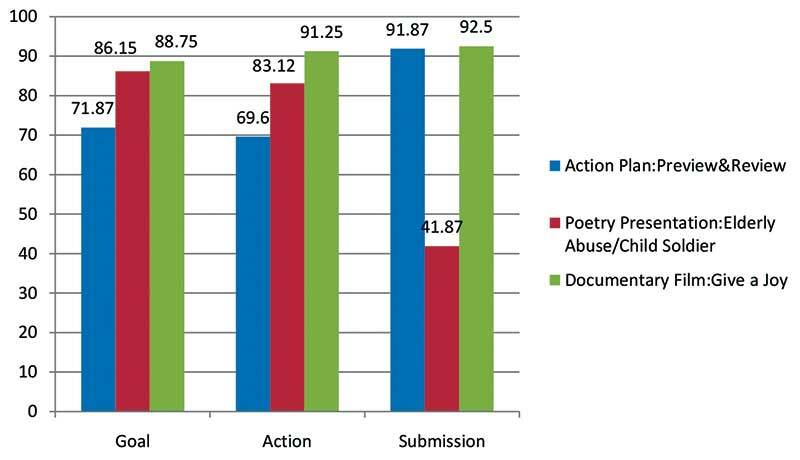 For example, in the first project work, Action Plan: Preview and Review, the marks allotted for the specific area were 24 out of 64, in the second project work, Poetry Presentation, and the third project work, Skit-Choice-Class IX, it was same as the former, and in the fourth project work, Documentary Film: Give a Joy, the weightage given for individual project file was 24 out of 96 and for group project file it was 116 out 360. 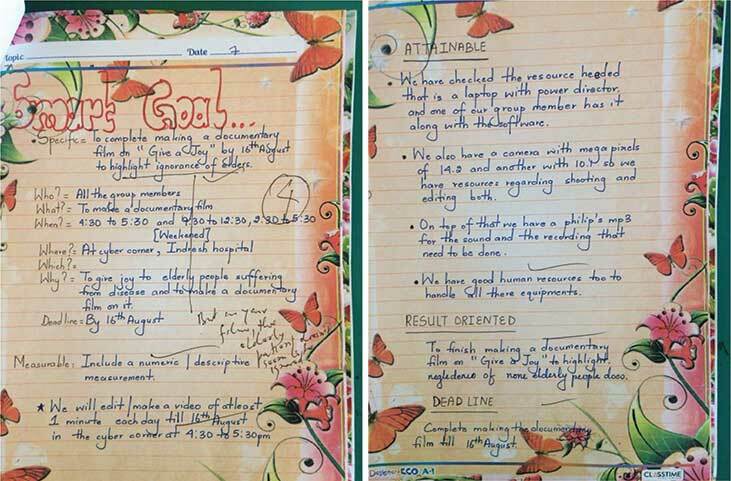 I analyzed the data of three areas of action plan – goal setting, list of actionable items and submission, and conclusion on the effect of the action plan on their project work. Following is a graphical representation of their performance in the three long-term project works assigned to both classes IX and X. As is evident from the graph, there is a remarkable improvement in goal setting from 71.87% in the first project work, to 86.15% in the second to 88.75% in the third project work. Similarly, in the List of Actionable Items, in the first project, it was 69.6% which increased to 83.12% in the second and further moved up to 91.25% in the third project work. With regard to ‘Submission’, there was a steep decline in the second, which was 41.87% as against the first, 91.87% and then a huge climb of 92.5% in the third project work. Most groups were late in the submission of the second project because it was assigned during summer break and they were supposed to turn in their work on their first day back to school. When students are given a long-term project work, I should assess their work at regular intervals rather than after submission because while assessing the first project work, I noticed that some groups had made their action plan according to the rubric given to them, not before they started working on their project, but after completing their project or while working on it just to get good marks. In the second project, I did not notice it as they had been alerted about this ‘error’ in my feedback to their project works. While assessing their second project work, since I had not given them a standardized format for an action plan, I faced difficulty in checking their work. Whereas in the third, I gave them a rough outline of the action plan, which worked quite well, but it still needs a lot of refinement, which I am going to do next year. I am satisfied with the result, but I am skeptical whether the students’ behaviour has been modified to the desired effect. Has making an action plan become part of their habit? Have they acquired the skill? Has it contributed to improving the quality of their project work? I am not sure about the first two questions. However, to answer the third question, I am sure it did so which is evident in the documentary films they made just in two weeks. Or does the graph merely reveal that my students perform well if there is incentive? MARKS! For students’ behaviour to change, this practice should be an essential part of every assignment they do, especially project works. If it is done, the lofty goal I have stated at the beginning of this article can be achieved. The author is an English teacher at Tibetan Children’s Village school, Dharamsala, HP.